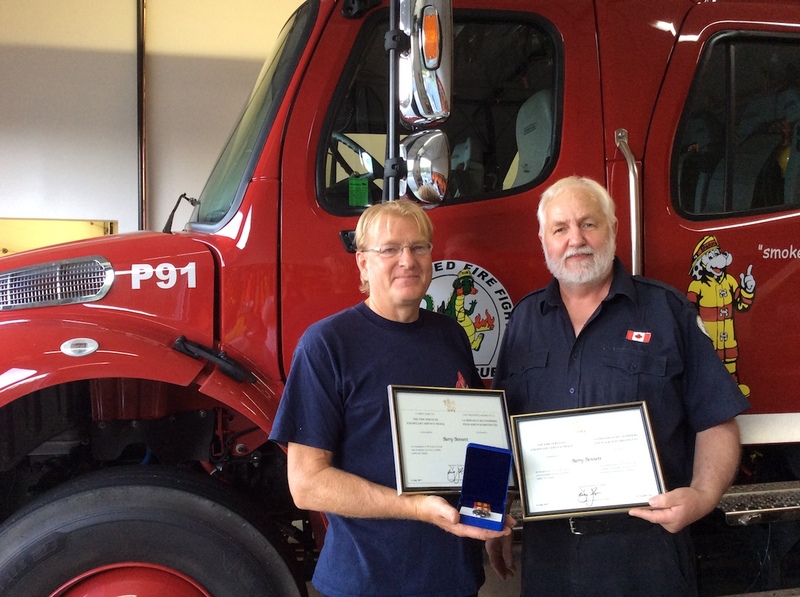 Pictured above is a presentation of the Fire Services Exemplary Service Medal to Fire Chief Barry Bennett (left) by PUFF Chairman Nick Vander Zande (right) in recognition of Bennett’s 30+ years of service to the volunteer fire department. PUFF is a rural fire department with no access to fire hydrants, which explains the need for portable water pumps. Their 17 volunteers provide fire and emergency medical first response services to 2,000 year-round residents but that number doubles when vacationers arrive to enjoy the abundance of lakes and forests. The largest volume of calls is for brush fires and many of the homes are difficult to access. Water needs to be transported by tanker from the nearest available lake, river or pond. A new water pump would reduce the turnaround time for tankers by more than half. When an alarm sounds, it’s often women who respond to man the radios, act as babysitters, and provide food and coffee for the crew. Funds are always needed and the team raises money through pancake breakfasts, barbeques, bingo, raffles, bass tournaments, and even lottery calendar sales with pictures of the local firefighters in action. I called board chairman, Nick Vander Zande with the good news. He said, “Wow, this is super to hear. It will go a long way.” He said they respond to a lot of wild fires over the 200 square miles under their care. Congratulations to the whole team at PUFF!